It doesn’t matter how you travel to Penzance. By train, by car, by plane, coach or boat. If you come by car from further away try to avoid the peak travelling time in the season. Season starts at Easter and runs until October. Which means that especially on a Saturday everybody is travelling to Penzance or back up country. Long queues on the A30/A38 or M4/M5 are likely. And during certain times of the day traffic around Penzance comes to a standstill. 930 – 1100hrs everybody is either travelling to a beach or if the weather is bad to the nearest town or amusement place. 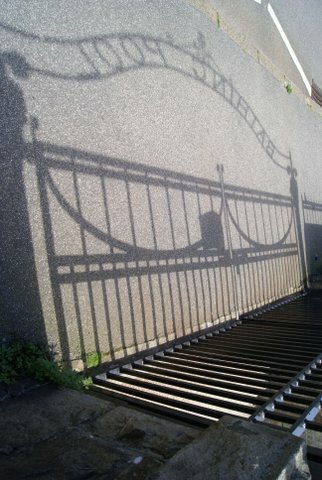 The same happens in reverse from about 1630hrs in the afternoon. If we have a spell of lovely weather do not expect to find a parking space at the popular beaches after 9ish They will have gone early in the morning even so it cost an arm and a leg to park. The nearest International Airport is Newquay. Lots of flights from the continent during the season and internal flights from London daily. But make sure you either book a hire car or a taxi. 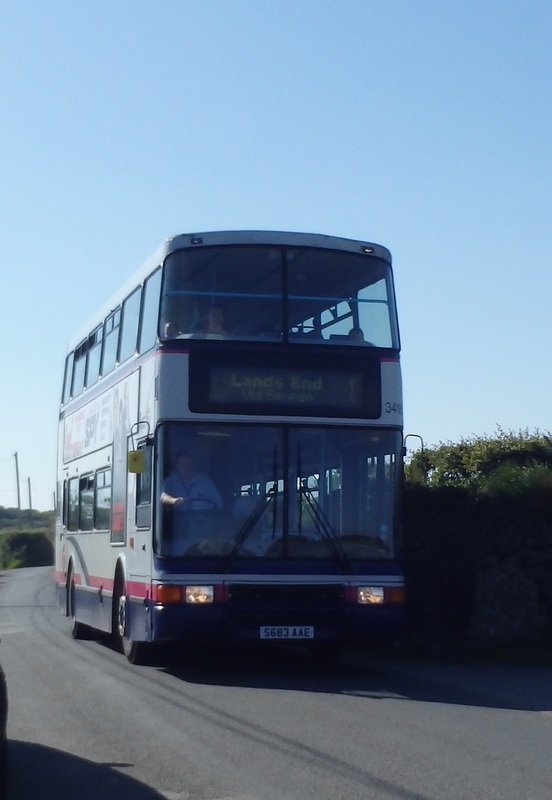 Because there is no sensible bus connection from Newquay to Penzance. If you are travelling by coach from London, Exeter or Bristol it takes even longer than the train and you don’t have the beautiful countryside and seaside to look at. Just not advisable, only if you really have to. 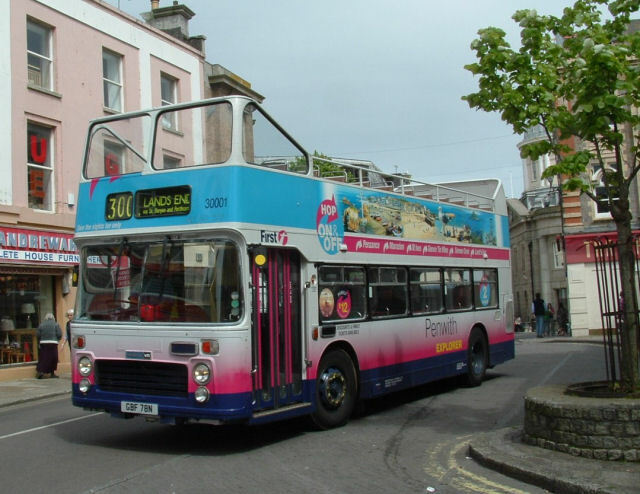 But of course you might come with a travel company to Penzance and your transport is sorted all the way. There are so many reasons why you should make Penzance the place to stay. I can only give you a taster. Penzance is an old town with a fascinating history. There is still so much to see from bygone days. From the remains of the old chapel that were found when the created St. Antony’s Garden. 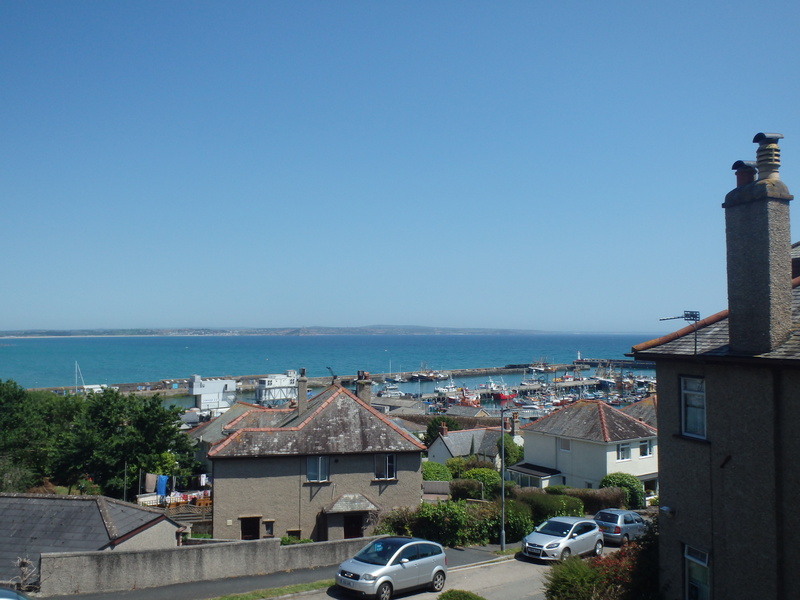 Wander along our promenade to Newlyn and Mousehole .Historic and famous places. There are many B&B, small hotels or hostels for you stay and to give you that holiday feeling. In 2016 Penzance was recognised as the foodie town of the west. With superb restaurants and chefs. All of the restaurants in Penzance or Penwith are of the highest standard with chefs of international recognition. Penzance is the hub for you to stay. From the town you can reach the SWCP and start your hike. Lovely circular walking tours and hike back to Penzance. 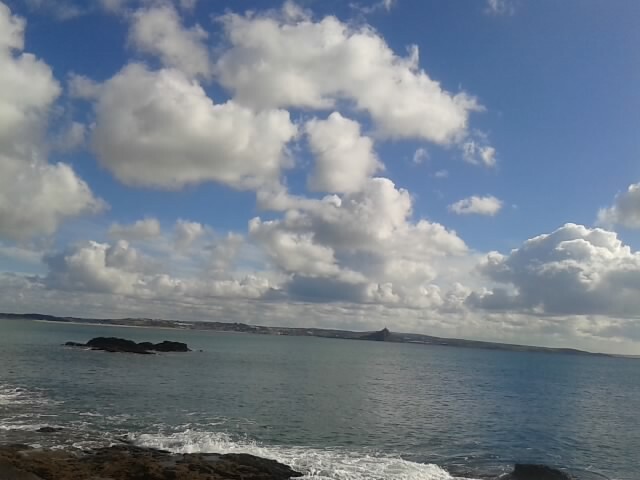 You can easily walk to St.Michael’s Mount (about 3 miles) via Long Rock and beach and walk on towards Perannuthnoe . A small village with an amazing beach, cafe, craft shop and gallery. Catch the bus to Mousehole and discover the old village, which was burned by the Spanish in 1595 in revenge for The Armada. Wander down to Newlyn and through the small streets where the artists lived and painted and played such an important part in the lives of the fishermen and women. Land’ s End is easily reached. Spent a few hours at this multiplex amusement park or walk on towards Sennen or the other way towards Portcurno. High above the cliffs you find The Minack, our open air theatre overlooking the sea. Visit St.Just, the old mining town with an ancient church and so many footpath leading to the coast. Cape Cornwall, Botallack and Geevor Tin Mine World Heritage Site. Visit beautiful St. Ives. An old artist colony full of history. Walk along the small lanes, visit some art galleries and enjoy a meal or just coffee in one of the lovely restaurant. Risk eating a pasty or ice cream sitting along the harbour, because the seagulls will spot you and try to take your delicacy. Because the traffic is so horrendous in the summertime I suggest you either take the early morning train from Penzance or drive to St.Erth and take the train from there. There is also a park & ride further along. But the train ride along the coast is amazing. You can also walk from St.Uny Church, Lelant to St.Ives along the coast. Not too strenuous, but a few steep hills. 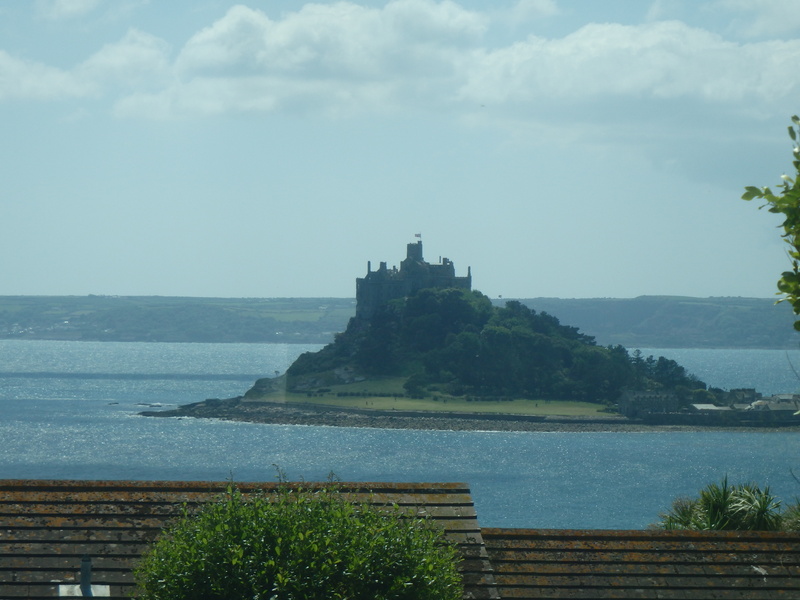 And if you feel fit enough walk the St.Michaels’ Way from St. Ives to Marazion. Part of an old pilgrim route dating back to the middle ages. This might be the most important step. It is all about the little idiosyncrasies that make life so different here in the far south west. If you are using public transport take your time. Summer traffic makes it very difficult for our busses to be on time. 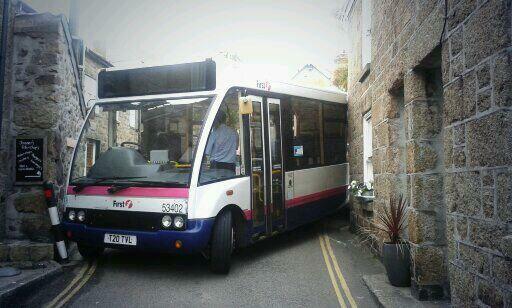 Do not expect to travel to Falmouth or Truro or even Tintagel by bus from Penzance. It will take you a life time. Falmouth and Truro are easy enough to get to if you go by train, but for Tintagel you better go up there for a couple of days to explore the castle and the countryside. Or hire a taxi . The weather plays an important role during you holiday. It can be the most amazing sunshine mild day in January and cold in July. Be prepared. Dreckly – this is a very important word in the Cornish language. It means don’t hold your breath. It might happen in 10 min , half an hour or tomorrow. Whenever ..
A Cornish pasty. A meat and vegetable filled pastry. A Cornish cream tea. Jam first. Important links for you to look up before you come to visit our lovely town. Swimming in the wild outdoors must be the fastest growing sport in the last couple of years. Swimmers travel to far away places to test their endurance. From extremely cold to extremely hard to reach or long swims. We are lucky in deepest Cornwall that the water temperature never falls much lower than 5 degrees Celsius and that is in March. There are many Wild/Sea swimming Groups in Cornwall and when you visit our lovely county, whatever the time of year, go and join some of these mad people. Please don’t try in on your own. from day break to dusk, all day long, weather permitting. Different swimmers meet up to swim these beautiful waters. Sometimes they are joined by seals, jelly fish or star fish. Battery Belles is the 11 o’clock group. Mostly women, mad as hatters, but very friendly. They all swim in cossies, but don’t mind anybody joining them in a wet suit. Or male. Be prepared for some banter and cake. And sometimes the air is blue – especially during the winter month. Their language can be quite colourful. When it is too rough to swim at Battery Rocks the swimmers relocate to the harbour , tide permitting. The harbour is and always will be the second choice. It is much safer to swim, but also a bit dirty and not so clear. There is so many beautiful beaches and coves to swim in Cornwall. Lifeguard cover is from Easter to September. Not all beaches have lifeguard cover. Make sure you are safe. Inquire how safe it is to swim and listen to the advice to the people who know. Never swim on your own. Make sure somebody knows what you doing where. But do enjoy our beautiful waters. Christmas time in Penzance is an exciting time. All about party time, long shopping evenings with lots of extra things going on to get you into the festive spirit. We have Humphrey Davy, the famous scientist, whose 200th birthday we will be celebrating on the 17th December. Children will be parading through the town with home made lanterns to honour his best know invention the miners lamp. On the 21st December Penzance will be celebrating West Cornwall’s Montol Festival. It is based on a Cornish tradition of Midwinter. It will start around noon and finish late in the evening. It is one of the wilder traditions of Cornwall. Strolling bands, fire throwing, traditional music, mask making workshops and story telling. At 4 pm there will be the Sundown Proclamation and the Guise Guild with lots of other costumed guises will parade from Causeway Head to Chapel Street. And at 6 pm the Midwinter Fires procession will set off Causeway Head to Princess May Recreation grounds. So dress up warm, take your lantern and join in the fun. But not only Penzance is throwing all caution to the wind and is partying. 11th December sees the switch on of Newlyn Christmas Lights with an amazing fireworks display. Father Christmas will be arriving on the Penlee Lifeboat. It will be the switch on of Mousehole Christmas lights on 12th December 7pm with carol service at the North Quay. (fingers crossed for decent weather.) And don’t forget Tom Bawcock night. This happens on the 23rd December at the village with music and a lantern procession. 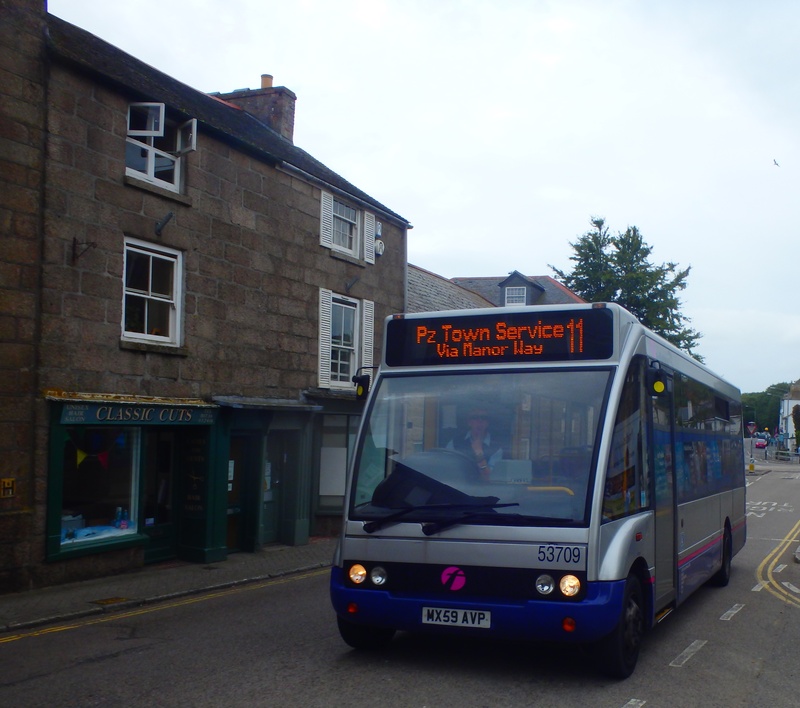 If you travel to Penzance by train or even if you come by car – travelling on a bus is a must. This is an experience not to be missed and cheaper than any ride at an amusement park. Then we have TravelCornwall. The are a small company that runs buses to the areas where the big buses can’t or won’t go. They also leave from the bus station in Penzance, but you won’t find any sings or timetable there, because FIRST removes them. hills and down the winding roads. They rattle and shake and break down with great regularity. Don’t shout at the drivers, they only drive what they have been given to drive. Instead sit back and admire their skill driving through these narrow lanes. Meeting other buses, large agriculture vehicles or our lovely visitors in hire cars, who don’t know how to reverse. It is not unknown for drivers to get out and reverse the car obstructing further travel. The smaller buses are used for some of our villages, where the larger ones just don’t fit. and sometimes it feels like you are ending up in somebody’s house. Also if you travel by bus through Penwith you save money on parking and the stress on finding a space during hight of the season. Buy a day ticket, and you can purchase all tickets from the driver, and you can stop of anywhere and jump on the next bus travelling on. In the summer you can travel the circular route:Travel to Porthcurnow and visit the Telegraph Museum and The Minack, our theatre on the cliffs. (It is a up a short steep hill. ) Then onto Land’s End. 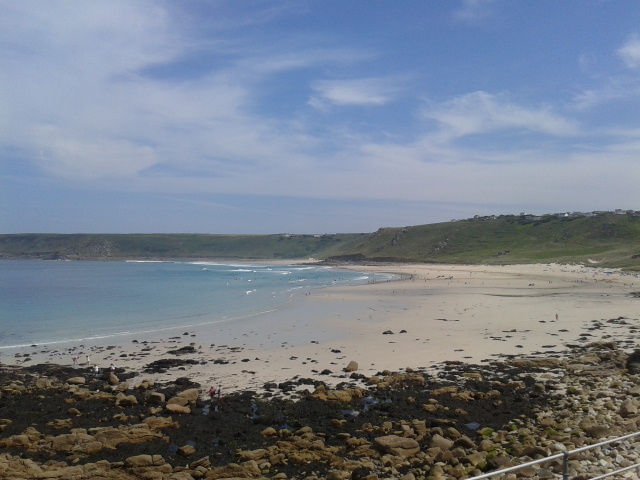 Enjoy the amusement park or hike along from the cliffs to Sennen. One of the most beautiful beaches in Cornwall. From there on to St.Just, an old mining town. The next few miles is steeped in mining history. Botallack and Geevor Tin mines. 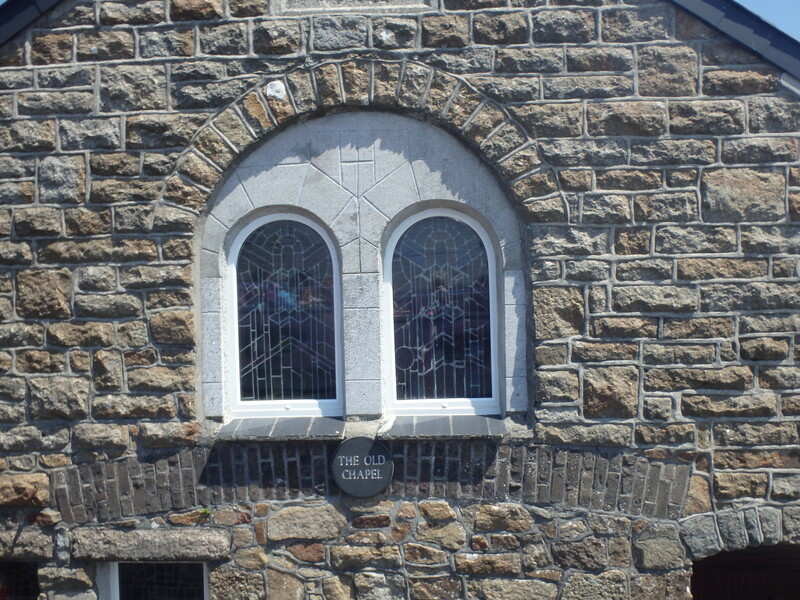 Do have another break in Zennor and visit the old Wayside Museum and Zennor Church. Where you find out how the mermaid captured the choristers heart. Maybe have lunch in the village pub. Onward along the scenic route to St.Ives.Spend a few hours in lovely St.Ives. A proper tourist seaside town and then catch the bus to Penzance. TravelCornwall runs the small routes through the communities. Amazing small lanes and everybody knows everyone. The best way to travel through Penwith. 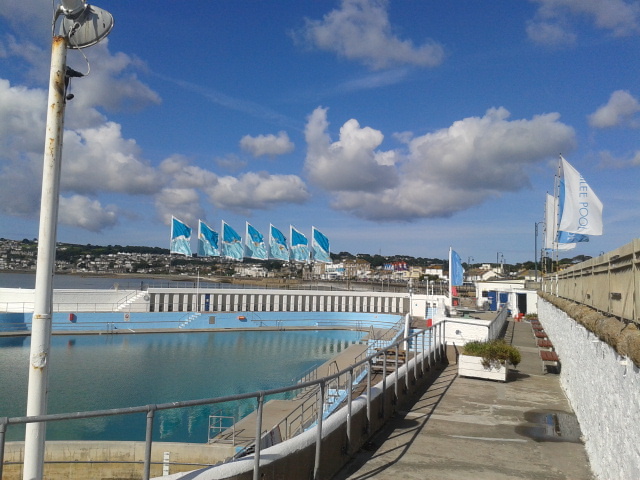 The Jubilee Pool of Penzance was built in 1935 to celebrate the Silver Jubilee of King George V. It is the FIRST & LAST Lido of the UK. And we like to think the most beautiful. It’s Art Decco design is suppose to remind you of a seagull taking flight. For years it was seen as an White Elephant and we nearly lost it, but the group ‘Friends of Jubilee Pool’ was formed and they worked hard to keep it alive. It was severely damaged in the Ash Wednesday storm in the 1960 and it looked as if the storms on Valentines Day might also put an end to it. But each time the people of Penzance and later the Friends of Jubilee Pool rallied round. Now, 18 month later, work is in full swing to repair it to its former glory. Fundraising by local people and support from the EU has made this possible. 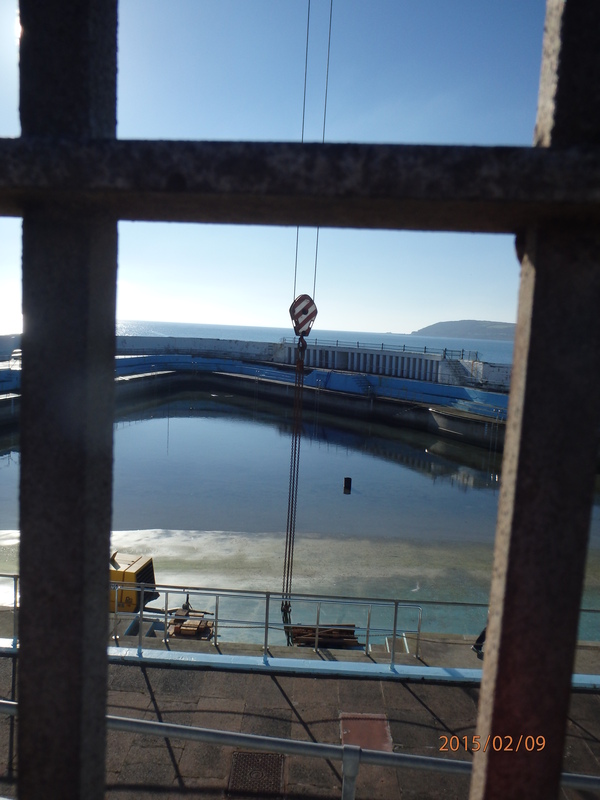 Work is continuing and with the commitment of the town, especially ‘Friends of Jubilee Pool’ it will open again in 2016. The weather is a fickle thing in Cornwall. 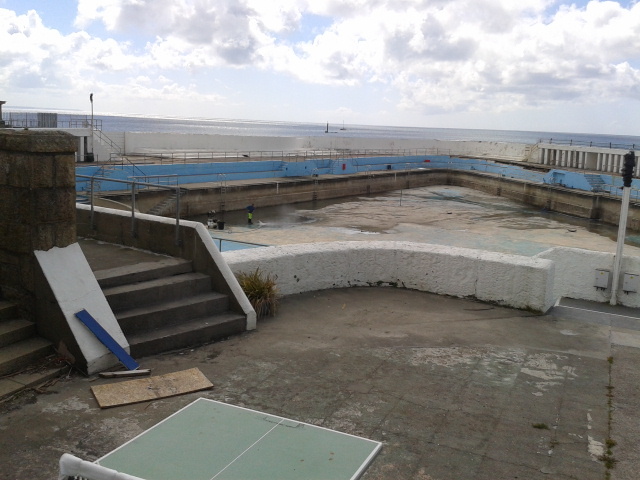 A year ago Cornwall was battered by storm and a lot of damage was done to property, rail line, promenades and our lovely Lido in Penzance. This year is so different. Cold frosty nights and lovely sunny days, sometimes with a biting wind forcing the temperature down, but when you get out of the wind – it is like a summer’s day. 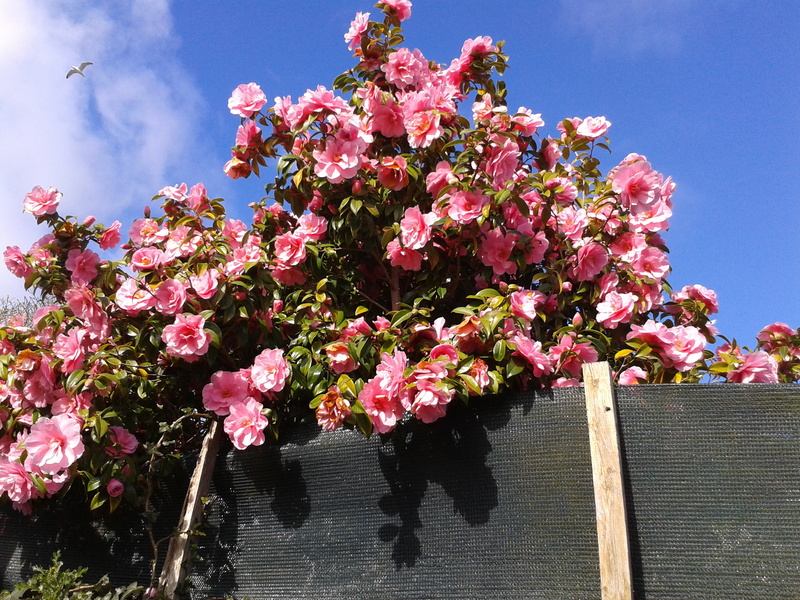 Camelias in all different colours are flowering everywhere. Everything is so early this year. Fields of Daffodils left to flower,because they have opened too far to be picked for sale. Hiking along the SWCP is a joy. The clear air makes it possible to see for miles. (Don’t forget to apply sun lotion – the sun can burn already ) Enjoy your time during this lovely weather in February. There is so much to see and do early in the year in Cornwall.